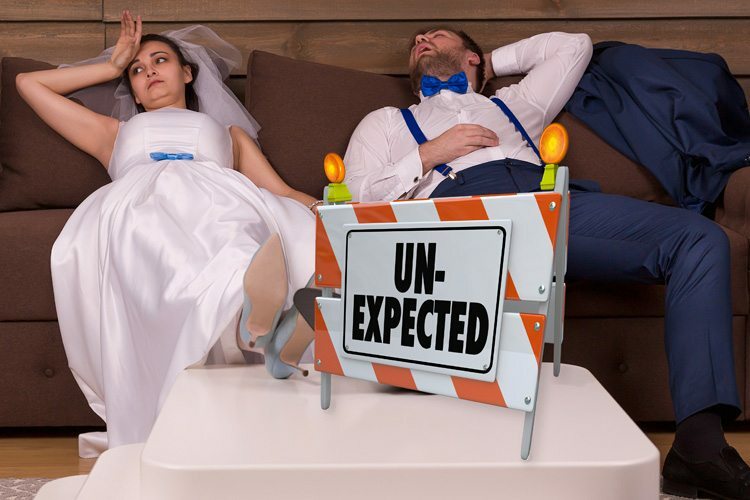 As we set out on this journey in the wedding world, we have learned very quickly to be prepared…we attempt to expect the unexpected. As we give daily tours, we have noticed every bride sees our facility in many ways. We have had one bride who does not want enough seats for all her guests. She wants her guests to be up, and mingling with each other, rather than remain seated throughout the ceremony. One bride was very adamant to walk out the back door, and all the way to the front door to make her grand entrance. We welcome all ideas, after all we are in the dream come true business. Going above the call of normal duty is what will set us apart from other venues. Example; 30 minutes prior to a wedding the groom approaches our staff and explains how a lady who was en-route to the ceremony had made a wrong turn and got stuck in the mud. This was not the bad part, she was also carrying the bride’s son, who was also the ring bearer. Yikes! We spring into action and dispatch a local friend with a four-wheel drive truck to rescue the lady and the all-important ring bearer. A few minutes later they are at the venue, and nobody was the wiser regarding the crisis that had just been avoided. From extra cake cutlery, to bottle water, to aspirin and the list goes on. As a venue owner you are never fully prepared for every event. We have even went to the extra expense of having a backup generator in place which will run our entire venue in the event of a power outage. I am in great hopes this is something we never have to use; however, I sleep better at night knowing my business is not completely dependent upon the weather. We understand being in a rural area we are more susceptible to this activity. So as the weddings continue to take place we pride ourselves in being prepared for whatever comes our way.